High speed. Industry leading accuracy. And scalable? That’s right. At 240 updates per second, LIBERTY continues to impress, delivering full 6DOF data, with virtually no latency--at less than 4ms. The system comes equipped with distortion detection, a high quality data assurance standard. Utilizing our proprietary AC electromagnetic technology, LIBERTY requires no line-of-sight, and allows for continuous tracking. The system comes standard with four sensor channels, with optional upgrades to 8, 12, or 16. 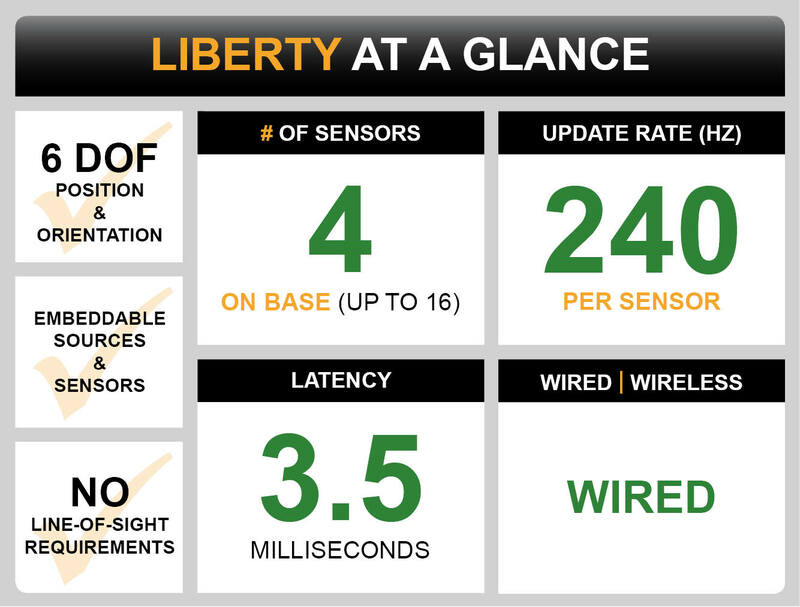 LIBERTY works with Standard Sensors and is fully compatible with Micro Sensors. Known in the industry as the forerunner in electromagnetics. When only the best will do, professionals rely on LIBERTY. Choose the LIBERTY 240/8 or the 240/16. Upgrade your system easily with additional circuit boards as your needs change. This feature alerts the user when environment changes are necessary to ensure absolute best data results.